Promate is the World’s No.1 Brand in Digital Gadgets, Mobile Accessories, and IT Products with more than 500 Innovation Awards. بروميت هي أفضل علامة تجارية في مجال ملحقات الأجهزة الذكية والمحمولة. حازت على أكثر من 500 جائزة عالمية في الابتكار التقني. This fun yet functional Robot Speaker will be the heart and soul of your party. Compact enough to fit in your pouch and loud enough for a picnic. Its wireless technology connects with compatible devices up to 10m away and allows you to control your music via the easy control buttons on the compact speaker – so you do not have to take your phone out of your pocket. It's designed to act as an ideal gift to let someone you know what you think about them. The Marvin has a High-Definition 3W speaker with enhanced sound drivers that take your music listening experience on to the next level. The surround bass sound provides you with a complete magically music experience. The bass is strong enough to give any song a boost and make it better and enjoyable without distorting the tune and sound. Play your favourite tracks with multiple connectivity options. The Marvin has Bluetooth v3.0 for wireless connection with your mobile phones or laptops or any other streaming device. It also has TF Card reader to play music or file stored on Storage Drives; you can also use the Micro-USB Cable with AUX Jack provided along to connect via AUX to any audio device or mobile phone with the Marvin and keep jamming. The Promate Marvin features all the buttons required to make your music navigation a breeze. The Marvin features a Mode Changing Button to switch between Modes. Volume rockers to make the volume increase or decrease according to your choice and a play and pause button to control the audio. The Marvin has an in-built TF card reader to make your music listening experience better. Now you can listen to all songs and music stored on your micro-SD card without any trouble of card readers and connectors. Just Plug and Play. The Marvin allows you to enjoy music with three different modes of your choice. The first mode is to connect any audio device or your mobile phone to Marvin via Bluetooth and keeping listening to pure wireless bliss. The second mode is inbuilt FM transmission, just press the mode change button to FM Audio and keep on listening to your favourite channel and music. The third mode is via Micro-USB AUX, or via TF Card Reader both provided on the Marvin to help you connect better. The Marvin is a complete party robot and to make it more party and kids friendly the Tail and Both eyes of the Marvin lights up to make it glow and make the party better. This Speaker also helps kids to enjoy music with it lit tail and eyes, that makes it cute and a centre of attraction for kids. You will never need to be without your music again wherever you go. Whether you're off on holiday, business trip, travelling or at home with your favourite tunes, this speaker's lightweight and compact build quality is astonishing considering the quality of sound. The Marvin comes with LED Indicators to show various functions. The Red-Light indicates charging (i.e. whether the device is being charged or not) and Bluetooth connectivity of the device is indicated by the blue LED. With a built-in 600mAh Li-on rechargeable battery, you receive a massive 6 hours of playback time, so the music will keep on going. When the battery finally runs out of charge, just simply connect the Mini USB charging cable and your speaker will be back to full charge in no time. The cute and Funny design makes it an ideal gift for any occasion-Birthdays, Holiday, Valentine's Day, Wedding, Children Day or Anniversary. I feel like I discovered this Robot. I'm super happy with it. Sounds just so-so, but it seriously does flash its lights to the music. 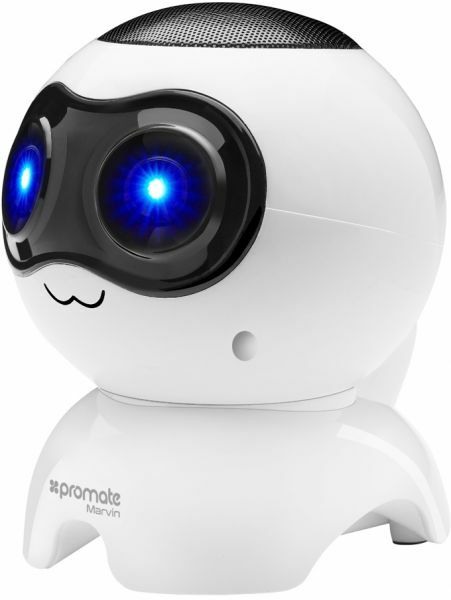 Cute robot speaker,easy to connect with and lasts pretty long on one charge. Sound quality is good for the size of the speaker. I liked it so much I got another in a different style. Great speaker for the price.